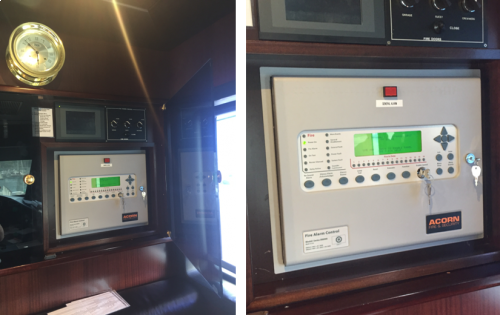 Recently Acorn Fire & Security were contacted to assist super yacht MY ELENI, to facilitate a repair or replacement of a defective and obsolete Marine Approved Fire Alarm Panel and to re-commission the full vessel. 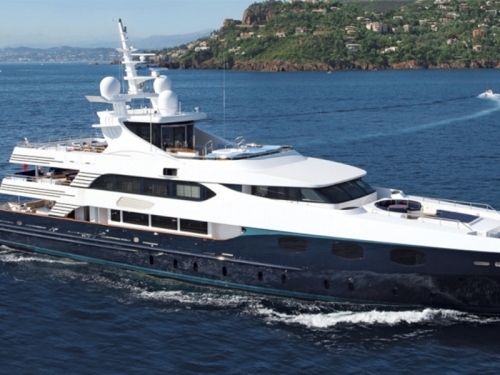 ELENI is a 50m luxury motor super yacht originally built by CBI Navi, which was fitted with a now obsolete Minerva T1008 Fire Alarm Controller. The client had unsuccessfully tried several international specialist companies from around the globe to help. The luxury super yacht was shore-bound and set to lose high revenues if they couldn’t get the Fire Alarm system up and running by the following week. Acorn Fire & Security quickly surveyed; and commissioned a “Special” Marine Approved Addressable Fire Alarm panel, built to the exact existing bulkhead cut-out dimensions, by UK manufacturers, Kentec Electronics. The special was rushed out to Acorn’s offices, fitted with multiple addressable/conventional zone interface modules, pre-wired and pre-programmed, then delivered next day to the berth at Ancona. Commissioning resource was further mobilised, with the new Fire Alarm panel installed and the whole Fire Alarm system fully commissioned whilst in Port. “We had a fault in the engine room, with the old Fire Alarm panel being redundant we had no way of isolating it and sorting out the problem. We therefore had to remove the guests off ELENI, and try to find a solution as quickly as possible which is where Acorn came in. We also had to run 24-hour fire watches, which was quite a headache in the middle of charter season. We were very appreciative of Martin’s assistance during our time in Ancona. As he would have mentioned, timing was tight, but he got the job done and we got through our surveys”. Lloyds register were completely satisfied as was the Marine surveyor. This new approach has now been adopted for future use on the majority of Marine super yacht Fire Alarm retro-fits. MY ELENI is now back in full charter throughout the Mediterranean and Adriatic. Acorn Fire & Security are a major distributor and commissioning support specialist within the fire and security industry, who go the extra mile offering alternative solutions to many problems internationally.